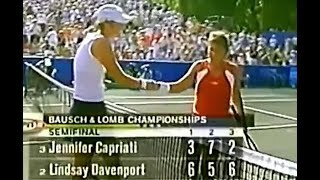 Lindsay Davenport vs Jennifer Capriati 2003 Amelia Island Semifinal Highlights. Lindsay Davenport vs Jennifer Capriati 2003 Indian Wells Semifinal Highlights. 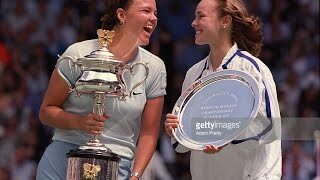 Lindsay Davenport VS Martina Hingis Highlight 2000 AO Final. Justine Henin vs Lindsay Davenport 2004 Indian Wells Final Highlights. Lindsay Davenport vs Gabriela Sabatini 1994 Year Ending Championships Final Highlights.